AAU Indoor Nationals Entry Deadline At Midnight! 2. WATCH Live On FloTrack! 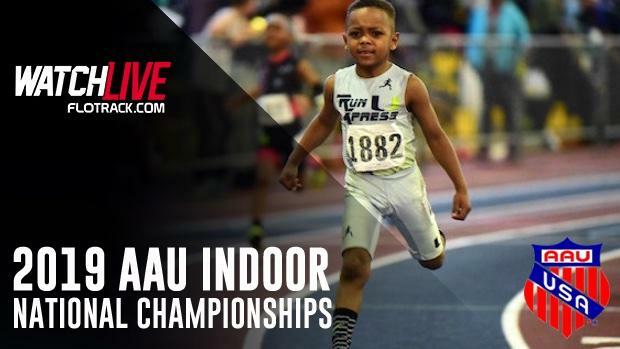 Below can find a time schedule and entries currently for this weekend's AAU Indoor Nationals to be held at the Prince George's County Sportsplex in Landover, Maryland from March 8th to March 10th. The meet will be LIVE streamed on FloTrack.com, while MileSplit.com will be on-site with photo coverage and meet updates as well as archiving race videos from the stream. It is also not too late to enter the meet as AAU is accepting entries up until 11:59 PM CT on Tuesday on CoachO.com. Registration link can be found here. Whether an high school athlete looking for one more post-season indoor racing opportunity before the outdoor season or a parent with a budding youth track season, AAU Indoor Nationals will be a high quality meet opportunity this weekend for all ages. The meet also includes an open and masters division. Who can forget 76 year old and barefoot William Rhoad becoming the star of last year's AAU Indoor Nationals?! This report includes all entries submitted as of 03/05/19 at 03:27 PM EST. This report can be refreshed once every 30-minutes until the 1st day of the meet. M 11 1500W No entries. M 12 1500W No entries. M 13 3000W No entries. M 15-16 3000W No entries. M 17-18 3000W No entries. M 13 PV No entries. M 14 PV No entries. M 15-16 PV No entries. M 15-16 800R No entries. M 17-18 1600R No entries. M 7-8 3200R No entries. M 17-18 3200R No entries. F Open/Masters 60H No entries. F 5-6 800 No entries. F 17-18 3000 No entries. F 15-16 3000W No entries. F 13 PV No entries. F 15-16 PV No entries. F 17-18 PV No entries. F 17-18 1600R No entries. F 7-8 3200R No entries. F 15-16 3200R No entries. F 17-18 3200R No entries.